Is Your Jaw Pain a Pain in the Neck? If you are suffering from neck pain and it keeps coming back, it may be worth checking your jaw, even if you don’t feel you have jaw pain. This is because not all jaw problems produce pain in the jaw. For some people the first sign can be recurring neck pain. This is particularly important if you have ever had any orthodontic work or suffer from face pain, sinus pain, or (non painful) jaw issues. This includes a clicking joint, uneven bite, or pain on yawning or eating hard foods. For some it’s hard to consider that a jaw pain can masquerade as a neck pain. A study as long ago as 20041 demonstrated that sensitisation of the jaw, even when at rest, can generate increased muscle activity in the head and neck. In 2016 a pilot study confirmed a hard link between the jaw and neck pain in computer office workers2. In 2017 it was shown that people with chronic neck and shoulder pain develop higher levels of jaw tension3. In the same year in another study showed that asymmetric jaw alignment or tongue alignment can lead to significant loss of neck movement4. Each of the research papers underlie the relationship between the neck and jaw, and in particular that one influences the other, and vice versa. Treating the jaw requires the skill of an experienced clinician. The jaw is much more complicated than meets the eye. Like the knee the jaw has a cartilage inside it. You can think of the cartilage as similar to a runner in a chest of drawers. As the jaw opens it glides along the cartilage runner to make a smooth mouth opening. However, it is not a hinge joint and this is why issues can arise. Initially the jaw glides forward along the runner, only after this will the jaw-hinge drop open. If the runner is damaged, it blocks the gliding action. This will block the opening/closing of the jaw. Classically the patient may find it difficult to fully open or close the mouth, or may encounter pain on chewing. Note, if the cartilage is only partially damaged, the jaw can be heard clicking because the jaw glides forward and bumps up and over the damaged (swollen) part of the cartilage. When the cartilage becomes damaged it is not usually not very painful to begin with. However it can get worse causing pain not only in the joint, but elsewhere too. Simply put the muscles which operate the jaw are connected to the skull and the neck. This includes a connection to the temples, throat and ear, which is why patients can sometimes feel they have a headache, difficulty swallowing or ear pain which accompanies the jaw problem. There are also nerve connections which can cause pain. In particular there is a phenomenon known as referred pain. Referred pain is poorly understood, but doctors know that pain in one area of the body can appear “magically” in another area, even though the second area has nothing to do with the problem. In such cases a jaw problem can create pain in the face, sinus or teeth, as well as the neck and head. Referred pain can arise in other areas too, so an intimate knowledge of this condition is required to correctly diagnose what is going on and how best to treat it. Like all joints in the body, the jaw joint can become unstable at it’s fullest range of motion ie it is potentially susceptible to damage on full opening. This includes maximum opening on yawning for example. Adding pressure at the same time, like biting a hard apple, creates deeper pressure in the jaw. Over time the cartilage weakens and eventually fails, causing pain and in ability to fully open or close the mouth, as previously mentioned. In acute pain, ie pain which has arisen suddenly applying something cold will normally help soothe the area. Apply a cool gel pack, covered in a cloth is necessary for about 10 – 15 mins. Cold is usually preferable as acute pain is typically accompanied by inflammation. Small gel cool packs are sold at the clinic for a nominal price. Sometimes the inflammation is beyond the scope of a gel pack. Provided you are allowed to take NSAIDS (ie Neurofen, ibuprofen naproxyn etc), taking a regular dose can help with the initial pain. Whilst it is difficult to massage oneself generally, you may get some relief by gently massaging your temple, the bone behind the ear, back of the head, under the skull and the neck. Sometimes moving your arms can help relieve some of the tension. Avoid eating/chewing on the painful side. This is the side where the damage is likely (but not always) going to be. Avoid chewy foods too, and try taking small bites. 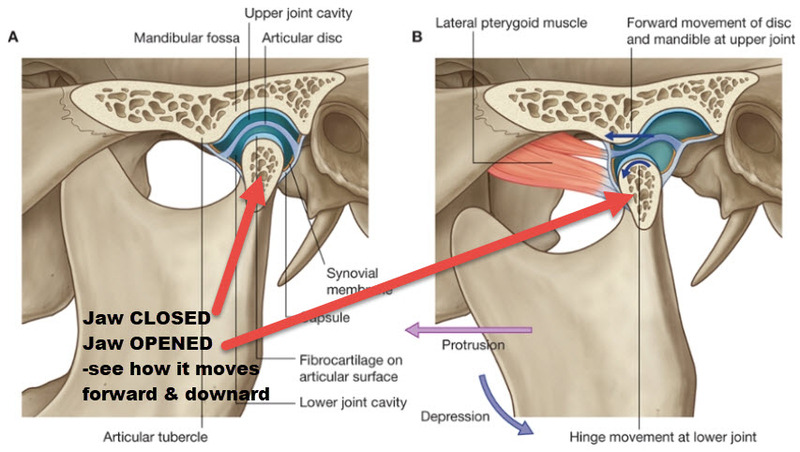 Beware: there are situations when the jammed side causes almost no pian, and the pain arises from the opposite side. So if your symptoms don’t improve always seek professional advice. It may be a complex case. As the jaw is weakest in full opening of the mouth, it makes sense to avoid extreme opening, such as deep yawns, big bites of fruit (ie apple), heating hard food items such as carrots. Avoid sleeping on the side which hurts and avoid sleeping on the stomach. Both these increase the chance of pushing the jaw into further difficulty. If you feel you grind your teeth, specially at night you may be at higher risk of putting your jaw out. Consult your dentist for a review with a possible view to wearing a mouth guard at night. Finding someone to treat the jaw can be a difficult ask because it straddles two professions, dentistry and mechanical medicine (ie osteopathy, chiropractic or physiotherapy). Further much of the work on the jaw is taught at postgraduate level, so its always work checking if your practitioner has undergone this extra training. 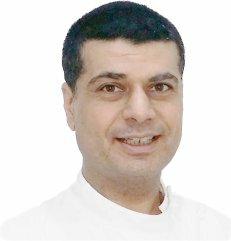 Mr Jamooji has extensive experience in jaw problems as he personally experienced this just prior to the extraction of his wisdom teeth in his mid-20s, not once but twice. Together with additional post graduate training he offers a sensitive and reliable treatment programme for all ages. 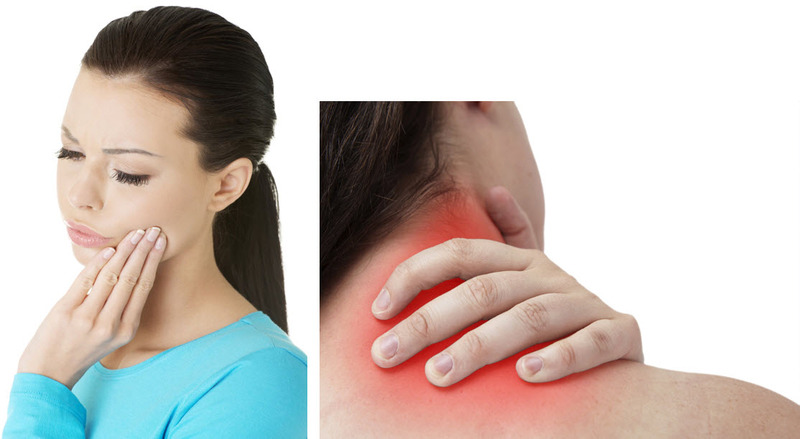 Visit our neck pain page for general information on how we treat neck problems. Alternatively fill in this online-form to see how we can help you today. To make a booking please go to our main osteopathy page or call 02089462331 and speak with our trained reception staff. 2 Associations among temporomandibular disorders, chronic neck pain and neck pain disability in computer office workers: a pilot study. Bragatto MM, Bevilaqua-Grossi D, Regalo SC, Sousa JD, Chaves TC. J Oral Rehabil. 2016 May;43(5):321-32. doi: 10.1111/joor.12377. Epub 2016 Jan 6.